Again, another project that I completed (I tried at least) long ago and never wrote an article for. After seeing some projects on instructables and hackaday that used DVD stepper motors to make 3D printers and laser engravers, I decided that I would try my hand at making one. I had lots of old DVD drives on hand from electronics recycling centers, and the electronics I purchased for under $50 from aliexpress. I used a RAMPS 1.4 board, an Arduino Mega, and the A4988 stepper drivers for this, as they are extremely cheap, and I didn’t want to spend a fortune on this. For the extruder, I bought one of the E3D clones, a PTFE tube for the bowden adapter, and the cheapest NEMA style stepper motor I could find – which turned out to be a bad idea, and there were no designs for filament feeders that fit this motor, and I didn’t want to spend the time to design one. The frame was built out of MDF cut by hand, and 3D printed right angle brackets and M3 bolts and nuts. I was surprised how well the 3D printed bolts and nuts stood up, and the frame was very rigid. As for the Y axis, I attached one DVD drive slider to the bottom of the frame. On top of the DVD reader sled, I attached a raised flat surface held up with springs and bolts (to allow for levelling). This surface was a 50x50mm piece of steel from one of the DVD drive casings. As a print bed, I think this would have worked fine, but I never got a chance to test it actually printing. 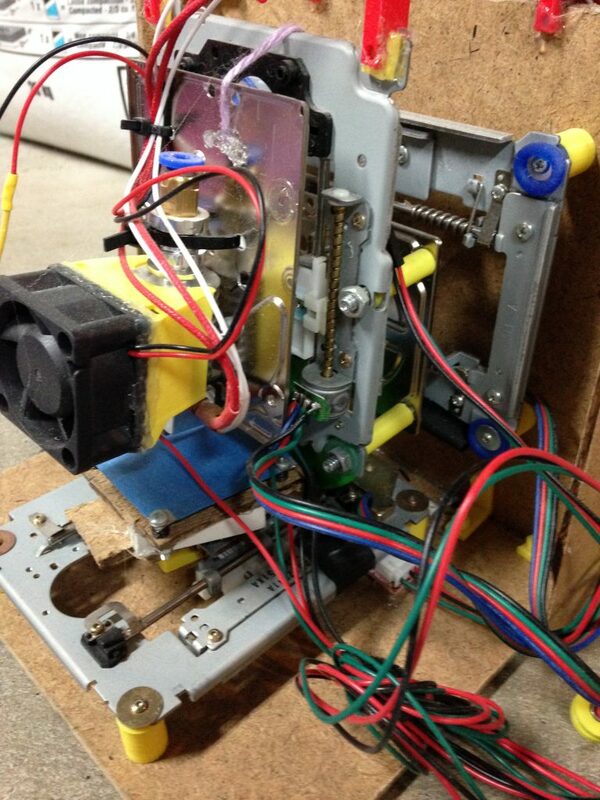 The X axis motion was again a DVD drive mounted to the vertical part of the frame. The DVD drive sled slides horizontally like a Prusa i3 would. To this drive sled, I attached the cover of a 2.5″ hard drive to give me more surface area to attach the Z-axis to. Up and down motion for the Z-axis was achieved with another DVD drive mounted to the X-axis. Connecting the stepper motors to the drivers required some prodding with a multimeter to figure out which pairs of wires were connected inside the 4 wire stepper from the DVD drives. 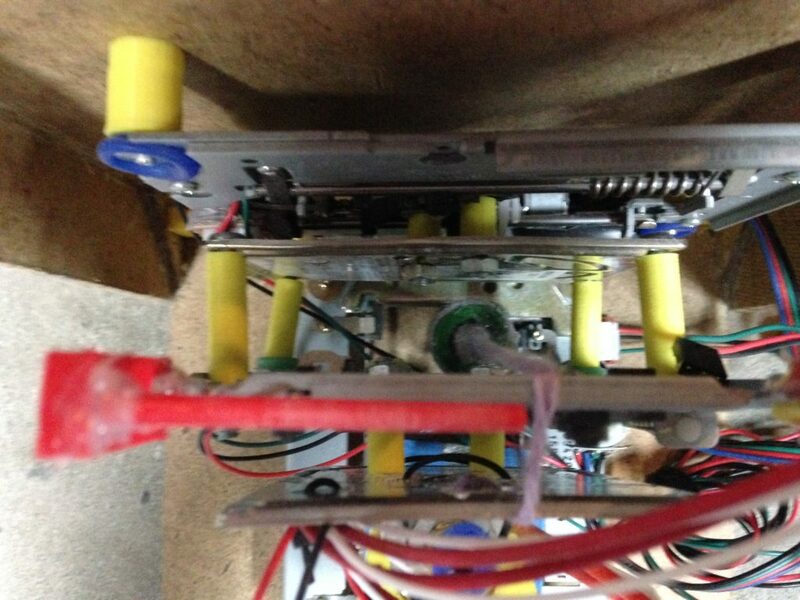 Once the two pairs were figured out, they were attached to the RAMPS board, and were ready to test. 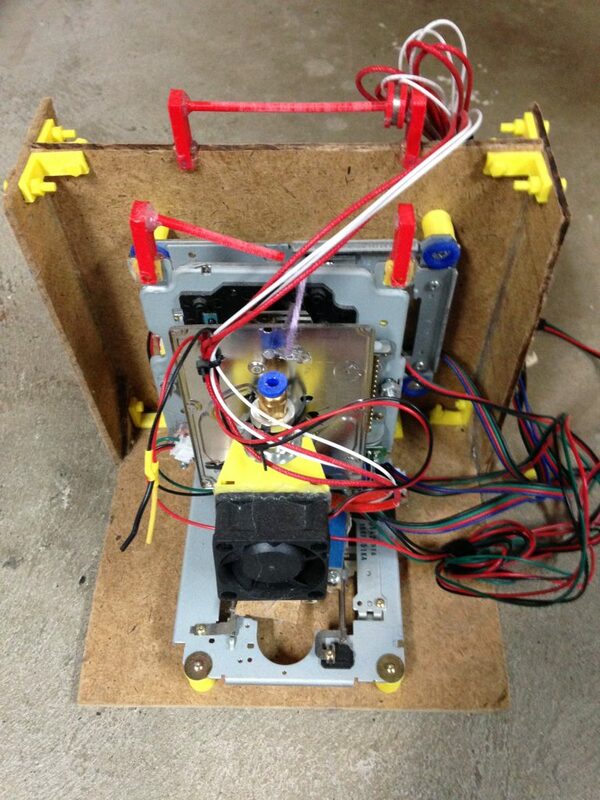 To the Z-axis, I attached the E3D clone extruder with a fan mounted on it. This choice of extruder (or maybe this would have happened with any extruder) proved to be the wrong one, as the DVD drive on the Z-axis was not powerful enough to raise the extruder. The next part to mount was the endstops, and as I was mounting them, I realized I should have thought about this earlier. Some disassembly and custom 3D printed pieces were required to mount them, as well as a fair bit of hot glue, which I was trying to avoid. Then the software – I opened up the Marlin configuration file and started modifying the values that I knew had to change. This was mainly the travel limits for all axes. Once everything was mounted and wired up, the testing started. I connected the Mega to my computer, and opened up Pronterface to control the printer. Through this, I was able to determine the correct steps/mm values to plug in the Marlin. The other thing that this testing showed was that the stepper motor for the Y axis worked really well. However, the same cannot be said for the X and Z axes. The X-axis moved very slowly, and did not have smooth motion. 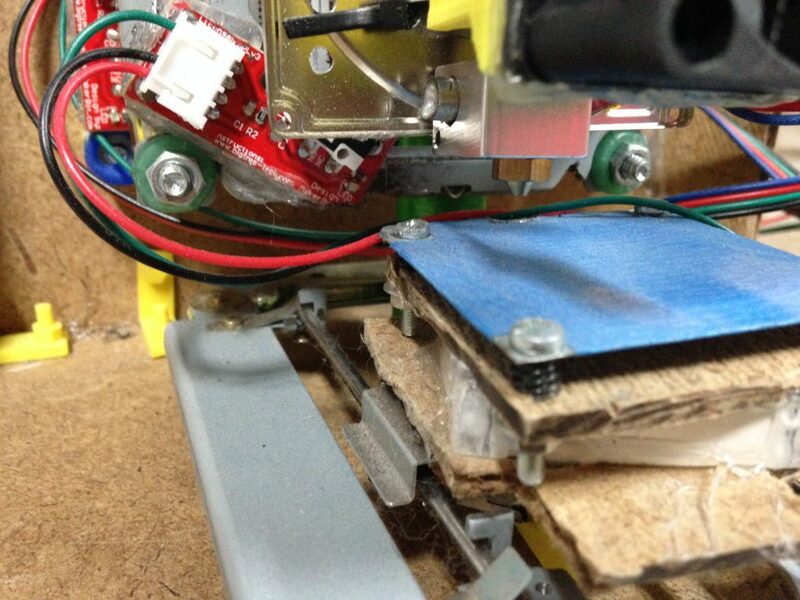 The Z-axis, without help, did not move at all while the stepper was getting very hot. To try and fix this, I tried to add a counterweight (an 18650 cell) for the Z-axis, but that did not help at all. One of the big mistakes I made while designing this was thinking of it in terms of separate items, and not worrying about attaching them until I got to that step. This caused some problems where parts would not attach together properly, and after a few hours of rigging something up, I had found a way to make it work but it was never elegant, repeatable, or sturdy enough.